Which Cuts of Beef to Choose for a Quality Tartar at Home ? Tartar is a delicious and different way to enjoy beef. However, given that the appeal of this particular beef dish is that it is prepared raw, it is important to prepare it correctly. There are certain cuts of beef that are most recommended when preparing beef tartar on your own at home. In many ways, tartar is a special dish that requires just the right type of beef to ensure that you are able to create restaurant quality tartar at home. The following are tips on choosing and selecting several cuts of beef that you may want to consider creating a quality beef tartar from home. Before even considering which cuts of beef are best for a quality tartar, it’s imperative to stress the importance of using quality meat. Because tartar is a dish that involves the consumption of raw meat, it is in your best interest to use only the highest quality meat. While you have the option of purchasing meat from a local grocery store, this is not the best option. A dish such as a beef tartare requires the freshest meat possible preferably from your local neighborhood butcher. Getting your beef from a butcher ensures that your beef is fresh, and you can even see your meat before purchasing so that you can confirm the freshness. When choosing to prepare beef tartar from home, skimping on quality is not something that you want to do. Getting quality cuts of beef from your local butcher ensures that you will enjoy your beef tartare free from many of the less than favorable conditions that you encounter from consuming raw meat that have been sitting around at your local grocery store. Remember, for the best beef tartare, the freshest meat is the best meat. When selecting cuts of beef to make your tartar from home, you want the cuts that are the most tender and flavorful. This is especially true because you will not have the benefit of using various cooking methods such as braising to make the meat tender. Thus, selecting the most tender, flavorful cuts of beef is recommended. Generally, you should avoid cuts of meat that contain a lot of connective tissue and sinews. You don’t want to get a mouthful of the connective tissue and sinews as it can be unpleasantly chewy. 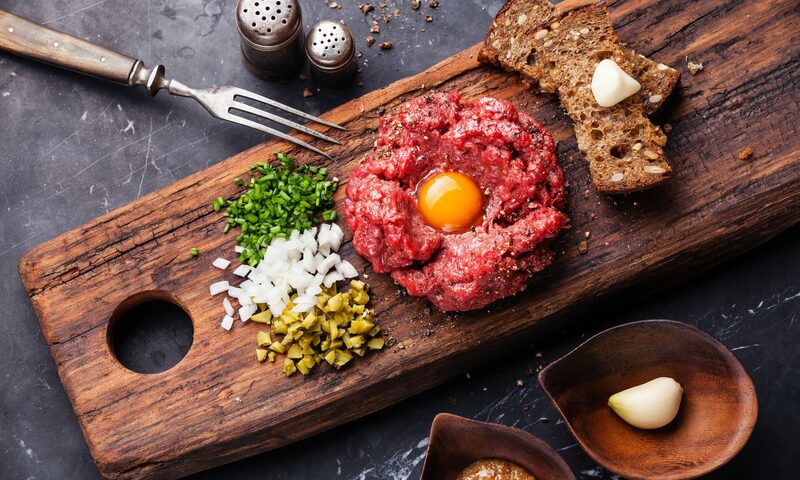 If you are unsure which cuts of beef contain the least amounts of connective tissues and sinew, talk to your local butcher and let them know that you are interested in making beef tartar from home and you want the most tender cuts of beef available. They should be able to present cuts of beef that are most ideal. Knowing that tender, flavorful beef is a prerequisite for preparing tartar, selecting the best cuts of beef is important. While there are a wide variety of cuts of beef, some are more preferable because of their tender texture and exceptional flavor that comes from high fat content. The high fat content is seen by the white marbling on high quality cuts of beef. – Tenderloin-This is by far your best cut of beef for tartar as it the most tender cut of beef and contains just the right amount of fat for flavor. This is the cut of beef that is used for filet mignon. The cut of beef that you choose can literally make or break your homemade tartar. Make sure to choose high quality, grass-fed beef from your local butcher to ensure that you are getting the most tender, freshest beef available.